Friday the family went to the local mall for some shopping and a trip to the food court. 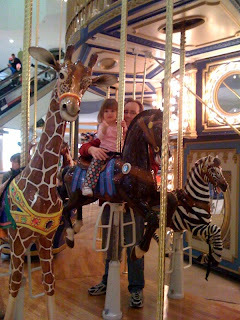 After dinner we walked through the center of the mall and Alyce noticed the double decker carousel. Of course we couldn't resist the opportunity to get Alyce up on a horse. Once Alyce was up on a horse and strapped to the seat she grabbed the brass pole with a vice like grib. She didn't seem scared. I think she was just concentrating on keeping her balance because she couldn't rely upon her feet for support. Alyce was interested with everything on the carousel and not interested in mommy trying to take her picture. Once we started moving Alyce really started to have some fun. She kept saying Wee! over and over again. I got Alyce to wave at Grams, Grandpa, and Mom a couple of times during our ride but once they were out of site her free hand was back on her horse. Eventually the ride came to an end and Alyce was ok with getting off her horse. 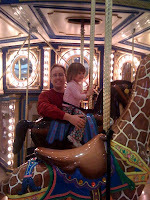 I think she was a big fan because later on when getting ready to go home she wanted to ride the carousel yet again. Sadly we had to say no to another ride, but Alyce seemed ok with that and we were spared of any tantrums or crying spells. 0 comments on "Carousel At The Mall"